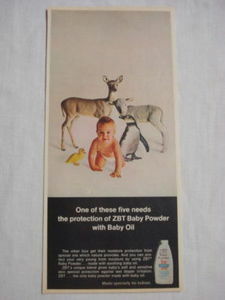 5"x10 1/2" trimmed original color ad from 1969 for "ZBT Baby Powder", featuring a baby and four animals. "One of these five needs the protection of ZBT Baby Poder with Baby Oil". 1894 Ad Century Cream Eastern Toilet Co., Portland, Me. 1897 Ad The J. B. Williams Co., Glastonbury, Ct.